Located at the left side of the provincial capitol in Nueva Vizcaya Philippines, the place used to be one of the sites of the annual trade fair during the week-long celebration of the province’s founding anniversary in May. But there’s more of its purpose rather than a mere trade fair site that generated a huge income during the festivities. 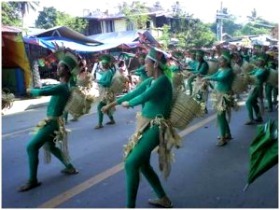 In fact, it is more precious than the wealth it can provide to the provincial government as it now serves as the place of “Ammungan”, a Gaddang term that connotes gathering among various tribes in the province and a venue to promote and preserve the rich culture of Nueva Vizcaya’s inhabitants. It all started with the concept of uniting all the tribes in the province and putting a distinctive identity of upland inhabitants and lowlands dwellers. Proponents of the tribal village said the establishment of the park was inspired by the the “Ammungan” festivals in 1989 and 1996 which was organized by the Nueva Vizcaya Heritage Foundation, Inc. to showcase the culture of a limited number of identified indigenous people. "Ammungan Park" showcases what has become of the conglomeration of the different indigenous peoples in Nueva Vizcaya where we call it Tribu Biscayano,”explains vice governor Jose Gambito, former overall events organizer of the 1st Grand Ammungan Festival in 2009. Within Ammungan park in Nueva Vizcaya Philippines are distinctive native huts built by tribal folks representing the Isinai, Gaddang, Bugkalot, Kalanguya/Ikalahan, Iwak, Kankana-ey, Ibaloi, Ayangan, Tuwali and other related tribes. To inspire tribal folks in putting in place traditional styles and other cultural symbols in their respective abodes, a native hut competition was sponsored by the provincial government, the National Commission on Indigenous Peoples and the Department of Tourism. From then on, tribal folks troop to the park from May 19 to 24 each year to participate in the tribal gatherings which were highlighted by the conduct of “Wat-wat” or sharing of consecrated meat which is similar to the tradition of “Padigu” among Ilocanos. Tribu Biscayano also identifies the migrant ethno-linguistic groups such as Ilocano, Pangasinense, Batangueno, Kapampangan, Bicolano, Bisayan, Mindanaoan, and other related groups and sub-groups including the children of inter-tribal marriages and of foreign blood origins. “This is without prejudice to the adoption of new members by voluntary action or by recommendation based on meritorious contribution to the overall development of the province,” Gambito explained. During the Wat-wat Festival at the tribal village, tribal folks garbed in their traditional costumes show their cultural dances and traditional sports as rice wine called “tapuy” is endlessly served to the public. During the 1st Grand Ammungan Festival, exotic dishes and native menus such as adobong Ahas (snake) and bayawak (monitor lizard), fried tateg or abal-abal were just but a few line of foods offered to young and old villagers including local and foreign tourists. Gambito said the Ammungan Park does not only showcase the rich culture of the Tribu Biscayano, but a place where the future generation develops understanding of their cultural origin and environment, foster unity and better cooperation among villagers with different ethnicities as well as mother dialects. Organizers of this year’s founding anniversary celebration of the province are deliberating on the possibility of bringing back the complete activities of the first Grand Ammungan Festival due to the clamor of the public.